Unfortunately, the bill as presented is weak – it does not include any measures to directly support clean energy innovation with drilling revenue. ITIF argued in its recent report, Drilling for Clean Energy Innovation, that raising revenue from fossil fuel drilling is a direct and bipartisan way to support clean energy innovation and mitigate climate change. 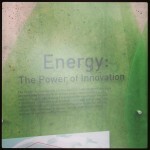 While the FAIR Act provides a unique incentive for states to invest in energy programs, there is little guarantee that any investment will be directed towards innovation. The proposal could be strengthened by allocating revenue to federal energy innovation programs like ARPA-E, that already direct key investments in breakthrough clean energy technology research, development, and demonstration. Onshore and offshore oil and gas drilling on federal lands generates about $11 billion per year. 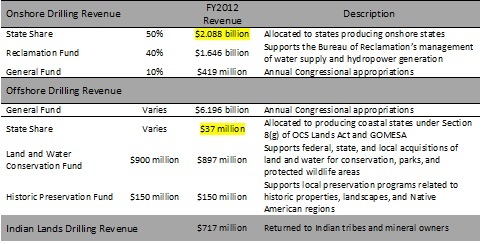 Proposals for directing shares of that revenue back to producing states or to dedicated trust funds are not rare, and many of these funds are already in place through current law, as shown in the table below. 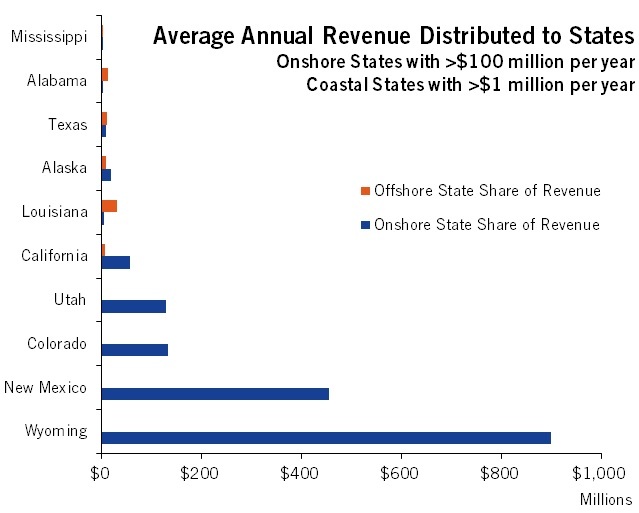 The current revenue distribution system awards onshore states with 50 percent of total revenue from production within those states, but only awards coastal states a percentage of offshore revenue under two circumstances: 1) if there is a border dispute about drilling within three nautical miles of the state’s coastline, or 2) if the revenue is generated from royalties, rents, or bonuses from tracts specified in the Gulf of Mexico Energy Security Act (GOMESA). Senators Landrieu and Murkowski argue that the disparity between onshore and offshore state revenue shares is simply “unfair,” since onshore states receive a share more than 26 times that of offshore states on average per year. If enacted, the FAIR Act would increase coastal states’ average annual revenues from drilling from about $68 million to $2.3 billion, by redirecting revenues from the Treasury’s General Fund to coastal states. 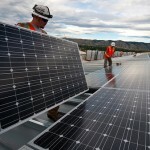 If all states createenergy funds asspecified in the bill, an estimated $767 million would be allocated to such programs. States can be powerful sources of job creation, economic development, and energy innovation, specifically because theyare able to act in careful consideration of state and regional strengths and weaknesses, and especially in the absence of effective, comprehensive federal policies. That said, state-based investments in energy innovation usually lack the coordination between research, development, and commercialization necessary to enable a strong energy innovation ecosystem. Investments by states are more diverse and difficult to track, and some states have more strategic ways of investing in energy innovation than others. Based on states’ current varied approaches to energy innovation and deployment, it is unlikely that new revenue from the FAIR Act for energy programs will support strategic investments in enhancing energy innovation ecosystems across the country without more specific guidelines. To position the United States as a leader in clean energy innovation, revenue from onshore and offshore drilling should instead be directed to a dedicated Energy Innovation Trust Fund that supports the Department of Energy’s Advanced Research Projects Agency-Energy (ARPA-E). As I argued in my last post, ARPA-E is the nation’s leading agency for investments in breakthrough clean energy research and its best outletfordeveloping high-performance clean energy technologies that are cost-competitive with fossil fuels, but funding for the agency is in a perpetual state of jeopardy. By increasing drilling fees onshore and offshore in exchange for expanding drilling in the Outer Continental Shelf, Congress could create new revenue to establish an Energy Innovation Trust Fund of at least $1 billion without increasing the deficit. The current system of distributing drilling revenue may be in need of reform, but changes to the system should prioritize funding investments that will reduce the nation’s reliance on fossil fuels and facilitate the development of clean energy. Securing support for energy innovation investments through oil and gas drilling on federal lands could strengthen the FAIR Act as a bipartisan policy that serves energy innovation ecosystems in states and around the country. 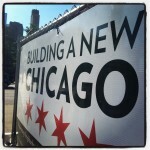 Originally posted on Energy Trends Insider.